Matilda has insulation! 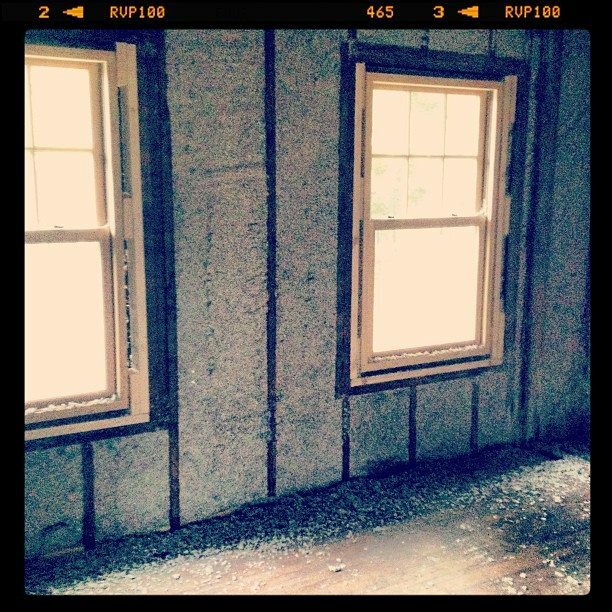 When they were blowing the insulation in, it seemed like it was snowing inside. Plus, there were huge drifts of it everywhere. So we hit a major milestone last week. A $92,092.95 milestone, to be precise. That’s the bill we got from the contractors for the past six weeks of work. It was such sticker shock, it’s taken me until now to stop hyperventilating and update you all. It’s not that we didn’t know that we would be spending that money, we just didn’t expect it in one big bill. Ouf. But, we have a beautiful roof ($10,000), brand-new though wholly unanticipated eaves ($13,000), no more lagoon in the basement ($1,000), final delivery of windows ($15,500), a furnace and a hot water heat and other water- and power-type things ($19,000), 40% of a new brick south wall ($5,500) and some other stuff. At this point, we’re near the end of our budget, so we have to find additional funds or start making some trade-offs. But the hunting on a deadline isn’t as much fun. I actually hate to shop and am more of a buy-it-when-you-find-it girl than a go-out-and-get-it girl. Plus, everything really has to tie together and that’s a struggle when I feel like Karl and I are negotiating our styles one fixture at a time — with the added pressure of feeling like You Will Live With This Forever So You Better Like It. For example, we set the vanity light fixtures at X height in the master bathroom. Because, well, it looked fine. But then I realized that the placement of the lights needs to play nicely with mirror and vanity choices. And, of course, we hadn’t picked out our mirrors yet so our height placement wasn’t quite right. Every detail has to be thought through so far in advance when you are essentially building a house. I totally understand, now, why people hire designers. The reason we can be looking at interior details is because we passed the insulation inspection yesterday. That means we are just waiting for the drywall to go up before Matilda will actually look like a house again! That’s pretty exciting. There have been stages where the house seems to be changing daily and others when it seems nothing is happening. Right now is warp speed. Now we just have to figure out the funding because our budget stops at drywall. We are exploring some loan options, but if they don’t come through we’ll pretty much be stalled out on the progress. But, we’ll be at the point that most people are at when they talk about “renovating” a house. We could have a bit of power and a bit of water. We could live in it for a spell without too much hardship, though we might still have to shower at our respective offices. (Not sure we have the money to install tile so that we can finish the bathroom.) It won’t be nice, but it won’t be straight-up camping. But if we can get the loan, we’ll be able to at least fix the floors and get closer to finishing the project minus, perhaps, trim. That’s actually a debate between us right now: do we go ahead and have the floors repaired where needed and refinished throughout the house, or do we just have the repairs done and leave it all rough? It’s a pain now or pain later type of thing. If we just repair the floors, we save money for other areas (like shower installation!) but it means having to clear out the house at some point in the future and redoing them ourselves. Not the worst option, but part of me just wants to get it done now and focus our later — unskilled — efforts on things like painting. Regardless of how it plays out, Matilda is really coming along. It’s really exciting to watch her progress. *P.S. : Even though we got a $92,000 bill, every penny has been worth it. We are so pleased with the work that’s being done on Matilda.